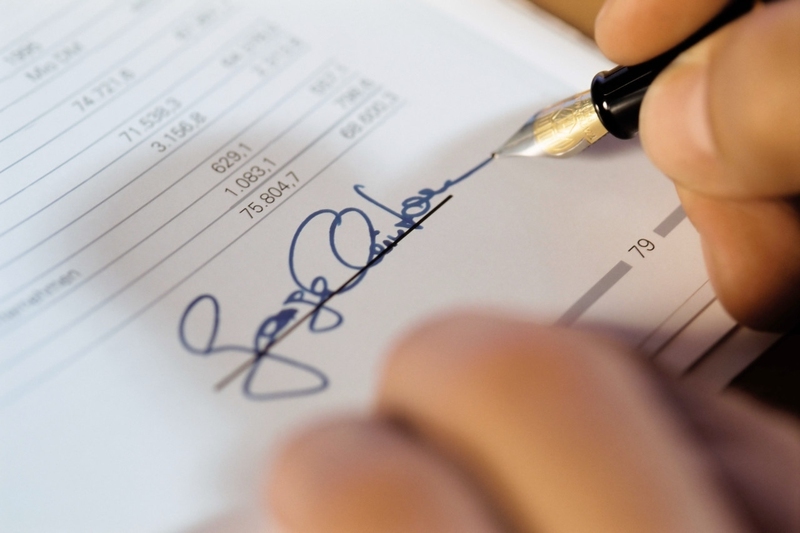 Your autograph or signature reflects your persona in more way than one. Your signature is exclusively personal, very much like your fingerprint or the thumb impression and can be used to identify you. However, many individuals have difficulty in developing a standard signature that they can use for all occasions. Oftentimes, they keep changing their autograph hoping that they’ll be able to develop a style that appeals to their aesthete. Contrary to what you may think, you can improve upon your signature and make it look appealing. Today, I’ll offer you tips on how to make a signature that you’ll be confidently using almost everywhere and for a lifetime. Signatures vary not only in appearance but in content as well. While some prefer to put down their first name others are more comfortable with their surnames. On the other hand, many individuals like to leave an impression of their full name. As far as you're concerned, if you wish to have a style that is inimitable, then start practicing signing off with your entire name. However, bear in mind that using only initials makes your autograph vulnerable to forgery. Do you want to go for short letters leaving space in between? Or, would you prefer slanting elongated letters with hardly any spacing? Does any particular font style like the Baskerville Old Face, Cambria or Calibri appeals to you? Do you wish to leave a lasting impression on people with your autograph making them feel that you’re an intriguing character? At the end of the day, you’d want everybody to make out that it’s your signature, so try to stick to a pattern that is not inscrutable. If you spare no effort in finding how to make a signature that looks incredibly stylish, you might end up with a mess. In other words, after trying out with different styles and patterns, and following different permutations and combinations with various font styles, shapes and sizes of letters, you designed a signature that you yourself cannot imitate. Then all your labor was in vain. So, it's important to keep it short and simple, like a characteristic slant of "t" or a unique stretch of the "y". You may have heard of the following lines by H.W. Longfellow, "Lives of all great men remind us/we can make our lives sublime/and, departing, leave behind us/footprints on the sands of time" and been inspired by it. Then there is every reason for you to get influenced by the autographs of great men who’ve motivated human beings through the ages. Have a look at the signatures of Salvador Dali, Picasso, Arthur Conan Doyle, Shakespeare, Mahatma Gandhi, and Leo Tolstoy just to name a few. Keep an eye out for any technique or pattern that you think you can incorporate in your autograph. In this tutorial on how to make a signature, you should have a signature that can be readable or legible but is very difficult to duplicate at the same time. In other words, you’ll have to practice a pattern or style where you use a font size and shape that is distinguishable but also requires quite an effort to make a blueprint. You can also make your signature illegible, like a scribble, which can make your signature hard to recognize, read and forge. Don’t shy away from experimenting with different techniques and methods when putting your autograph on documents and papers. Make changes whenever you think is necessary. Compare and contrast your recent autographs with your previous ones to get more ideas. It’ll be totally up to you to figure out the changes or alterations you’d have to make -- if any letter needs to be shortened or elongated; or which font shape, style or size appears singular and so on, and so forth. Since many people would attempt to classify your personality traits via your signing style and its size, keep it moderate. In other words, the letters should neither be oversized nor be microscopic but of medium length. You could experiment by writing larger capital letters, by stretching the mark of certain letters like Y, T, P or S by creating a loop at the end or adding a distinctive style. You could practice a mode that gives others the impression that you’re well versed in calligraphy. Here comes another tip on how to make a signature. Don’t hesitate from making changes that you instinctively feel will make your autograph distinctive. Step back and see if you like the changes you’ve made and how your altered autograph looks vis-à-vis the earlier versions. Once a particular pattern catches your fancy, you should keep practicing the same as much as you can so that every new autograph resembles the past ones. You certainly wouldn’t want to be inconsistent when it comes to making the unique twists or turns as this style will be there in your bank account and other IDs. Don’t make changes that you find difficult to replicate. Naturally, you’d want to have a signature that you’ll be able to rewrite again and again, especially on your IDs and legal documents. So you have to adopt a pattern that can be duplicated easily by you whenever you need to. If that is not the case, then you’d have to consider altering your style and make it uncomplicated so that you can write the same signature repeatedly. The last secret in how to make a signature is to practice a lot. To keep reworking on your signature can be great fun as you’ll see different modes and styles emerge in front of your eyes. Try to write a signature quickly with a flourish as well as write your name sometimes using slow movements. Compare and contrast the different patterns and techniques and see which ones catch your imagination. Use a good quality pen with which you can scribble lucidly. In case, you want to completely rub out what you’ve scribbled, practice signing with a pencil. Server responsed at: 04/22/2019 8:31 p.m.